Your antenna question is simple, but the answer is complex! First off, I think the RSP1A is a great choice as it’ll give you proper exposure to the world of SDR (1 kHz to 2 GHz!) at a modest price. Unlike a portable radio of course, your SDR must be connected to a PC, laptop, tablet or some sort of mini computer like Raspberry Pi. This limits your ability to easily try different antenna locations within your home compared to, say, a battery-powered portable radio. It might take some dedicated experimentation and patience. Indoor antennas are so vulnerable to the radio noise within your home. If you live in an off-grid cabin with no radio interference nearby, even a simple $1 random wire antenna hooked up to RSP1A’s SMA connector would yield results. I occasionally spend my summers in an off-grid cabin and it’s simply amazing what you can do with a modest setup when there are no man-made radio noises around. Listening to the final broadcast of Radio Netherlands in an off-grid cabin on Prince Edward Island in 2012. But how many radio enthusiasts live in an off-grid cabin? Answer: very, very few! Most of us only get to experience off-grid life during natural disasters when the electrical grid has been damaged in our neighborhoods. You’ve told me previously that you live in an apartment in an urban setting, hence you probably cope with a lot of RFI. When an antenna is indoors, it is forced to function within this RFI-dense environment. Your telescoping whip or wire antenna doesn’t discern between radio noise and your target broadcast signal. Thus, noise can overwhelm your receiver, essentially deafening it to all but the strongest shortwave broadcasters. And simple, inexpensive portable amplified shortwave antennas? I’ve expressed my opinions about them before. They amplify the RFI as effectively as they do broadcasters. This is why if you had a means to put a small random wire antenna outside–even if it was simply draped outside a window–it would likely perform better than an indoor antenna. I’m guessing this isn’t an option for you, Chris. 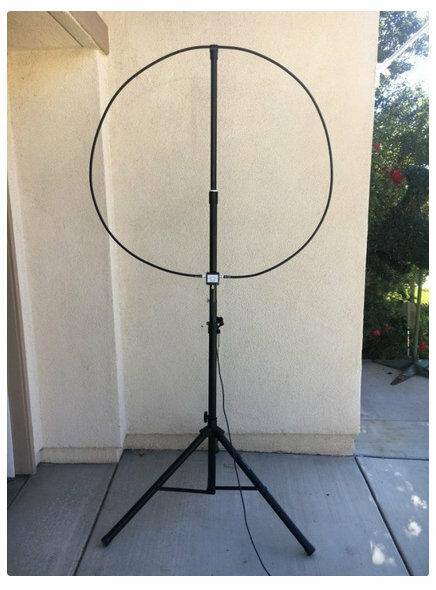 While you can build an amplified mag loop antenna (like our buddy, TomL) it’s not a simple project. Passive single turn loop antennas, on the other hand, are quite easy to build but are narrow in bandwidth (here’s a very cheap, simple passive loop project). You would likely design a single passive loop to serve you on a specific brodcast band and would have to retune it as you make frequency changes. You could build a passive loop antenna for less than ten dollars if you can find a good variable capacitor. Here’s another tutorial. Commercially produced amplified wideband magnetic loop antennas are not cheap, but they are effective. If you’re a serious SWL, a good mag loop antenna is worth the investment. The most affordable and portable mag loop antenna I own is the PK Loop. I have the more compact PK Loop C-LOOP-HDSW6-18 (6 – 8 MHz), but Guy Atkins also touts the slightly larger Ham Loop which he finds tunes beyond the advertised 3.5 – 14.5 MHz range. PK Loops are not as broad in bandwidth as the other antennas I mention below. You will have to retune the loop with any band changes and sometimes even within a specific meter band. Click here to check out PK Loop offerings on eBay. To my knowledge, the W6LVP is one of the most affordable larger diameter amplified wideband mag loop antennas. We’ve published positive reviews of this antenna in the past. W6LVP sells two versions of the antenna–since you’re not operating a transmitter, this $250 model would be all you need. indeed, if I were in your shoes, this would likely be the loop I purchase–very cost effective. Wellbrook antennas are the staple magnetic loop antenna for many DXers. Wellbrook loops are manufactured in the UK and have been on the market for a very long time. Their re-engineered Active Inoor Loop Antenna LA5030 would serve you well. At £240.00 (roughly $330 US) plus shipping, it’s one of the most affordable in the Wellbrook line, but over a $250 budget. Wellbrook makes a number of loops, but since you have no plans to mount this outside, I believe their indoor model would suffice. I have the RF Pro-1B and am very impressed, but it’s overkiil for your application (and twice the price of the W6LVP loop). Even if you build or purchase a magnetic loop antenna, you still need to eliminate as much RFI as you can on your own. A couple years ago, our friend London Shortwave wrote a brilliant guest post about fighting urban noise. Read through his piece and try to implement as much of his advice as you can. I hope this helps, Chris! This post is by no means comprehensive, so I hope others will chime in and comment with their experiences. Good luck fighting urban noise and I hope you enjoy your journey into the world of the SDR! This entry was posted in Antennas, Mediumwave, News, Shortwave Radio and tagged Chris Freitas, Mag Loop Antennas, Magnetic Loop Antennas, Noise, Pixel Shielded Magnetic Receive-Only Loop, PK Loop, PK Loop C-LOOP-HDSW6-18, PK Loops, QRM, Radio Frequency Interference, RFI, W6LVP, W6LVP Loop Antennas, Wellbrook, Wellbrook LA5030 on February 9, 2018 by Thomas. Thank you, Kenneth, for sharing your review! It’s nice to have an alternative to the pricier Wellbrook and Pixel Loop antennas. Someday, I’ll get around to reviewing the W6LPV loop antenna as well. Click here to view W6LVP antennas on eBay. Click here to view the W6LVP website. This entry was posted in Antennas, Ham Radio, News, Shortwave Radio and tagged Antennas, Kenneth Wigger, Loop Antennas, Mag Loop Antennas, Magnetic Loop Antennas, W6LVP, W6LVP Loop Antenna Review, W6LVP Loop Antennas on January 28, 2018 by Thomas. I’ve just finished building a variation of the W6LVP amplified magnetic loop antenna. I was able to purchase the preamplifier, power inserter, and the power supply separately. I then created my own loop antenna using LMR400Max coax and designed my own knock-down PVC support. I wanted something extremely compact and portable to take on sae-kayaking expeditions and to DXpeditions to Africa. I spent many years teaching in the DRC Congo and hope to return. I’ve used a 6’ loop, a 9’ loop, a 12’ loop, and an 18’ loop. All do very well, but the 6’ and the 9’ seem to do the best. I’ve been using the 9’ length of coax doubled into two loops and that seems be be doing extremely well. The signal strength from the W6LVP variation is equal to my Parr EF-SWL End-Fedz 45’ dipole, but the reduced noise level on the bands is amazing. I live in a central city high-rise with no possibility of an exterior antenna. The EF-SWL is strung out a 5th floor window down the side of the building. It performs well, but with a high degree of noise. My QTH is rampant with QRM and RFI noise. The W6LVP amplified magnetic loop has really resolved that in a big way. The bands are horrible at the moment, so evaluating the loop antenna is difficult. But the cleaner, stronger signals of CHU Canada on 3339 kHz and 7850 kHz, as well as WWV on 10,000 kHz is impressive. I’m impressed with the reduced noise level on the bands tuning across them, as well as the noise-free signal once you lock into a station. I’ve heard hams on the 17 mb for the very first time. So far, I’m very impressed with the performance of this amplified magnetic loop. Very cool Larry! You’ve build a compact loop that can bring the RFI down to a tolerable level–I’d say that’s a complete success. Thanks for sharing! Click here to read our previous article about the W6LVP loop. This entry was posted in Antennas, Ham Radio, How To, News, Shortwave Radio and tagged Antennas, Homebrew Mag Loop Antenna, Larry Thompson (WPE8EKM), Mag Loop Antennas, Magnetic Loop Antennas, QRP, W6LVP, W6LVP Loop Antennas on September 28, 2017 by Thomas. Just curious if you or anyone you know have any experience with Magnetic Loops from W6LVP? […]Here’s his eBay page – 458 feedbacks and 100%. Thank, Troy! I’ve never used the W6LVP loop, but the price–in comparison with other wideband mag loop receive antennas–is very attractive. The Wellbrook Model ALA1530LN-2 and DX Engineering (Pixel/Inlogis) Model RF PRO-1B magnetic loops are both good amplified receive antennas. However, they are both expensive. Shipping the Wellbrook antenna from the UK to the US adds another $100. Extensive side-by-side testing of the Wellbrook, DX Engineering, and W6LVP receive loops was compiled using simultaneous WSPR signal-to-noise reception reports on all LF, MF, and HF amateur bands. In addition, extensive laboratory bench tests measuring gain, signal-to-noise ratio, and IMD were also performed. Signal-to-noise ratio is important to pull weak signals out of the noise and IMD is important to reject distortion caused by nearby strong transmitters such as AM broadcast stations. In both test regimens, all three antennas performed very well and without significant difference. The antenna version listed here includes a power inserter for use with receivers or with transceivers that have a separate receive antenna input. If your rig doesn’t have a receive antenna input, check out my antenna with a transmit/receive switch. If you live in the shadow of one or more high-power AM broadcast transmitters, contact me about a special version just for you. Please contact me at lplummer@vcnet.com. 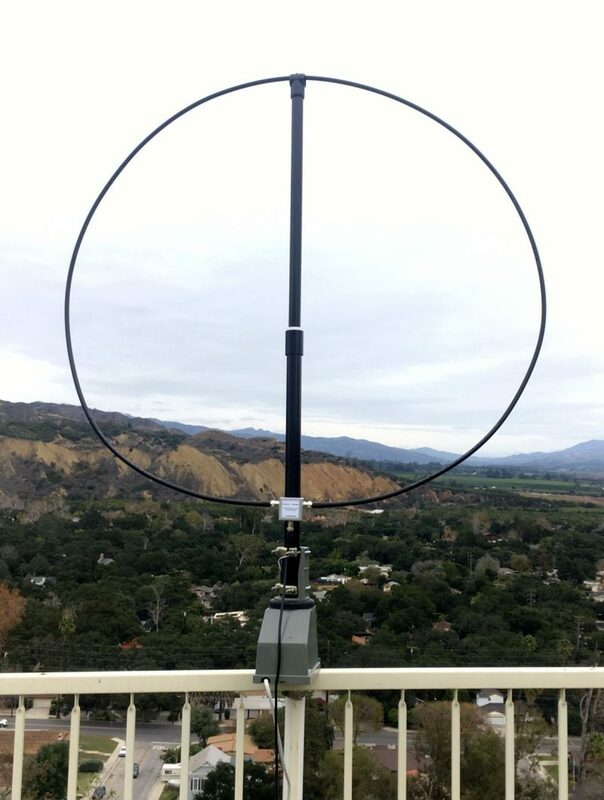 The W6LVP mag loop is a complete receive antenna system delivering top-of-the-line performance to amateur radio operators and SWLs – particularly for those with space and/or budget limitations. It is a great complement to vertical or wire transmit antennas. You have a knob to turn up the power but don’t have one to turn up the received S/N. Ten foot circumference (approximately 1 meter diameter) loop. Small size yields a natural stealth for HOA challenges. The loop is rigid enough to maintain its shape but flexible for portable transport or attic installation. Includes a low-noise, broadband amplifier covering 2200 (135 kHz) through 10 meters (30 MHz) with no tuning or adjustment. Perfect match for continuous tuning SDR receivers. Great for contesters to quickly check all bands. Greater coverage is possible at reduced performance. Light-weight antenna structure fabricated from furniture-grade PVC yields a strong but very light antenna weighing only 2 pounds (not including power inserter or power adapter). Great for both portable/camping as well as fixed installations. Light weight and small size make for lower shipping cost – particularly compared to shipping from the UK. Directly compatible with a low-cost speaker tripod stand (not included) for portable operation. Compatible with light-duty rotator (recommended) for fixed operation. Loop can be rotated to null interference by up to 30 dB or enhance desired signals. Includes low-noise linear AC power adapter to generate clean 12 volts for the loop amplifier. Unlike the DX Engineering antenna which requires 24 VAC, power can be easily supplied by 12 volt batteries during portable operation. Reverse polarity and short circuit protection provided by automatically resettable fuse. Eham reviews are very positive–so far, 5 stars on all six reviews. I am very curious if any SWLing Post readers have ever compared the W6LVP loop to the Wellbrook or Pixel Loop antennas. I actually own the Pixel Loop and might very well purchase, review and compare the W6LVP loop later this year (if time allows). If you own the W6LVP loop and/or have compared it with the Pixel or Wellbrook, please comment! This entry was posted in Accessories, Antennas, Ham Radio, New Products, News, Shortwave Radio and tagged Mag Loop Antennas, Magnetic loop, Magnetic Loop Antennas, Troy Riedel, W6LVP, W6LVP Loop Antennas on February 24, 2017 by Thomas.